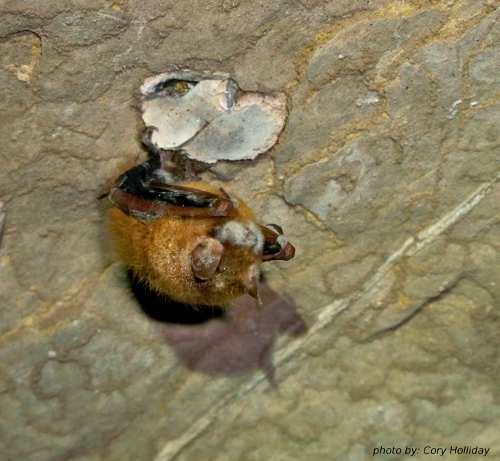 The Tennessee Bat Working Group (TNBWG) was formed in the summer of 2004 in recognition of the need for cooperation among various groups and individuals to help coordinate the conservation of bat species in Tennessee. The scope of the TNBWG is the study and exchange of information relative to the conservation, biology, ecology, and management of bats and their habitats on all state, federal, and private lands within the state of Tennessee. The goal of the TNBWG is to conserve bats and their habitats in the southeastern United States through collaborative research, education, and management with a focus on bat research, conservation, education, and management within the state of Tennessee. Find more TNBWG information and details about upcoming meetings on the "About" page of this site. The 2018 TN Bat Working Group Meeting will be Wednesday, 14 November in Oak Ridge, TN at the UT Arboretum (901 S. Illinois Avenue, Oak Ridge, TN 37830). To help our hosts plan appropriately, please Register for the Annual Meeting. NOTE: We have implemented registration costs to help meet meeting expenses and fund a cash award for the top student presentation. The registration fee will be $10, and will be collected at the meeting in the form of cash or a check made out to the Southeastern Bat Diversity Network (or SBDN). The registration costs are for professionals only - there is no registration fee for students. Anticipated meeting time: 9:00 AM - 4:30 PM Eastern Standard Time. Lunch will be on your own. If you would like to present at the meeting, please send your presentation title and an abstract to Dr. Brian Carver by 6 November and indicate if you are a student or a professional. If you have upcoming bat related events here in Tennessee that you would like to share with the TNBWG here on our website, please contact us! The TNBWG created outreach boxes full of hands-on teaching aids about bats for teachers and other environmental educators. In these boxes, you will find books for all age groups, along with bat skeletons and preserved guano samples. Demonstrate how scientists catch bats with mini mist-nets. Show kids the diversity of food types eaten by bats with a bat lunch box. Do you know how big the largest bat is? Show kids the almost 6-foot wingspan with a felt bat. Learn more at our Resources for Teachers page! Working group members present a bat program for Vanderbilt's School of Science and Math. A bat presentation was given at the Williamson County Library by Sara Samoray and can be viewed Here on YouTube. The working group held a bat blitz at Edwin Warner Park in Nashville on May 16th. Unfortunately, low temperatures cut the night short with only 1 capture of a Tri-colored bat and several acoustic recordings of Red bats. Despite the low captures, It was a really good experience and we appreciate the cooperation of Nashville Metro Parks staff and all that attended. The 2017 TN Bat Working Group Meeting was held Thursday, Nov. 16 in Sewanee, TN at the Sewanee Inn.. Thanks to all who made it out.We had a fantastic meeting with almost 60 attendees accounted for. Thanks also to each of the speakers who provided engaging and informational presentations on bats in and around TN. The working group elected three new board members and a secretary. You can learn more about the board on our About page. Described by some biologists as the most precipitous wildlife decline in the past century in North America, White Nose Syndrome (WNS) has killed more than 1 million bats since it was discovered in 2006. WNS gets is name from the white fungal growth typically found on the face and wing membranes of infected bats. More details on White Nose Syndrome in Tennessee can be found at the TNBWG WNS page. National information can be found on the U.S. Fish and Wildlife Service WNS website and Fact Sheet. The Pennsylvania Game Commission and Bat Conservation International have also produced a Story Map describing the spread of this deadly syndrome across the United States. The text for the Bat Facts and Bat Description pages of this website were taken with permission from the Bats of the Eastern United States poster. Acknowledgements for that poster read: Bats of the Eastern United States was prepared by Troy L. Best (Department of Zoology and Wildlife Science and Alabama Agricultural Experiment Station, Auburn University, Alabama), J. Scott Altenbach (Department of Biology, University of New Mexico, Albuquerque), and Michael J. Harvey (Department of Biology, Tennessee Tech University, Cookeville). R. R. Currie (United States National Biological Service, Asheville, North Carolina) and K. Sutton (Arkansas Game and Fish Commission, Little Rock) generously provided permission to reproduce parts of Bats of the Eastern United States by M. J. Harvey (published by the Arkansas Game and Fish Commission, United States Fish and Wildlife Service, and Tennessee Technological University, 46 pp., 1992). W.M. Kiser, and R. S. Lishak reviewed an early draft of the manuscript.